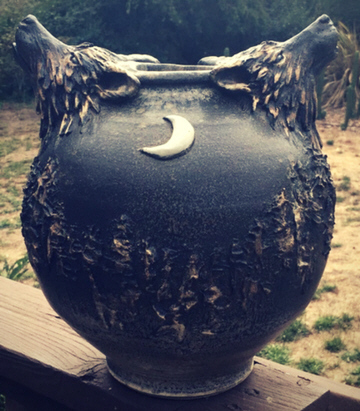 This amazing piece of pottery, which I’ve named The Wolf Cauldron, was given to me by a very special person. With this precious gift, she acknowledges one of my first totems. We share the wolf on our walk through this forest called life. Thank you, my dear friend. About the artist: Laurie Hennig creates from her studio in Boulder Creek, California. I love working with people who are open to creating – whether it’s creating your life, creating change, or creating your birthright to express yourself in a magical way. As a child, the wolf was always my ally. I imagined this creature running through the woods on all fours, seeing distances that my child eyes could not see, smelling the dirt and the pine tags deep on the forest floor. Free. This vision was held deeply in my heart, supporting me to create a different story than the one I lived every day. Creating is such an important divining tool for being able to see the three dimensions of life, to touch, to hear, to taste. With my fingers drumming on the table, head cocked and resting in my left palm, I search for the words to tell the story of this beautiful gift. How do I convey my love for wolves, and also produce a tasty stew that would feed the part of us that wants to run free in nature and to create? With this question in the air, I would like to share a piece I wrote about the beautiful Wolf Cauldron. Two wolves — breaths close, yellow eyes searching, noses sensing the smell of what was to come. The cauldron was being created to hold their stories. The wolves circled the creator, heads held high, teeth lit by the fire smoldering nearby for the final casting. The old woman with her boney long fingers began to mold the cauldron with song, with words with clay dug from the grounds where many had passed before. The clay was black, like the night sky. She reached into the sky and drew star matter from Sirius the Dog Star spirit and began to knead the fine particles into the clay, creating a translucency that reminded the wolves of where they had come from and the ancient ones they had met there. Her eyes were as yellow as theirs. The cauldron began to form, like a huge bubble in the waters of the mother’s womb. The wolves came closer and began to draw their claws through the clay as a reminder of where this cauldron came from. She placed the moon on the cauldron to remind the world of the deep psyche of the unconscious and to represent times when darkness, stillness and solitude can be powerful teachers to show us the way. As the old woman turned and looked upon the wolves, she plucked the head of the first and placed it on the left side of the cauldron. Then the head of the second was plucked and placed on the right side of the cauldron. The wolves knew this was where they were to be. This cauldron was to be their home. The home that would carry the stories of the old, the stories of the new, the stories of the present. The stories that bring the medicines of trusting our instincts, our hearts, our bodies, and our minds. It would be filled and overflowing with words, the constant reminders of the life we must lead to trust our higher selves, share our wisdom and our truths. Storytelling is just one way to create, of course. To create, we must draw ourselves into that space of curiosity and of the unknown, and prepare ourselves to birth an offer, a gift to share within ourselves or with the world. How do you reconnect to your birthright of being a creative, imaginative being? Here are some questions that could help connect you with your creative side. First, take a deep breath, feel your feet, come back to your body. What is it to be creative for you? How would you be creative? Does anything keep you from moving forward in your creativity? How can you begin to express who you are through your creativity? What would you cook in your cauldron? How would you share your “meal”? As a master coach, she helps people increase their effectiveness and unlock their potential by integrating intellectual, emotional and physical components into embodied practices. In her work as a deeply-experienced Somatic bodyworker, she supports clients in overcoming historical patterns to build a self that can gracefully face change. Madeline studied for 19 years at the Strozzi Institute and has more than 25 years of business experience.